You may have charitable money to give away that you are not even aware exists. 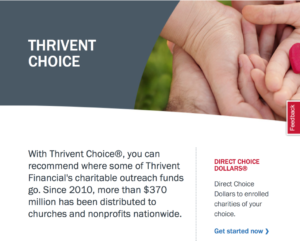 If you are a Thrivent Member, Thrivent Choice is a program that makes supporting Lutheran Bible Translators as easy as a few clicks or a phone call. You decide which organization(s) should receive your allocated Choice Dollars. Your Choice Dollars are based on the dollar amount of the qualifying products (insurance, annuities, etc.) that you have with Thrivent. And this money is just sitting there, waiting for you to direct it toward the things you value. Lutheran Bible Translators (LBT) is one of the organizations eligible to receive your Choice Dollars. I would appreciate your help. Please take the time to support Bible translation through Thrivent Choice. Wish you could give more? Many people want to help Bible translation beyond what they can give from their regular income. Thrivent’s Choice program can help you here. Your Choice Dollars can only be designated by you. And they do not affect your policies or fund balances at Thrivent. There’s no need to wait! Click here and follow the instructions. Or call 800-THRIVENT (800-847-4836) and state “Thrivent Choice.” Thank you for your help and support! IMPORTANT REMINDER: Please remember that you must go through the gift direction process every time you receive notification that Choice Dollars are available. Unfortunately there is no way we can automate this for you.